Space disasters are failures of technology, design, and management leading to tragic loss of life. While fatal accidents such as the Columbia Disaster, the Challenger Explosion, and the tragic flight of Soyuz 11 spur dramatic response, there is just as much to learn from the unmanned failures and near misses that highlight design and operational weakness further from the public eye, because when a space accident doesn’t claim lives, it is more a matter of luck than one of preparedness. This section of Space Safety Magazine is dedicated to episodes we wish never happened, black pages in the history of spaceflight, accidents and disasters whose occurrence reminded us how dangerous venturing to space can be. Disasters in space have occurred ever since the invention of rocket powered flights in the early 20th century. Although failures have happened in both manned and unmanned flights, missions with human losses always have maximum impact on the government and the public. – Rick D. Husband, William C. McCool, Michael P. Anderson, Kalpana Chawla, David M. Brown, Laurel Clark, Ilan Ramon, in the Columbia Disaster. Of these, the only three that actually died in space were Dobrovolsky, Volkov, and Patsayev, the crew of Soyuz 11, who suffocated for a cabin pressure loss. The Apollo 1 fire happened on the ground during a test, but it can be considered an actual space accident because its causes are rooted in spacecraft design failure, inadequate safety procedures, and quality control in manufacturing. 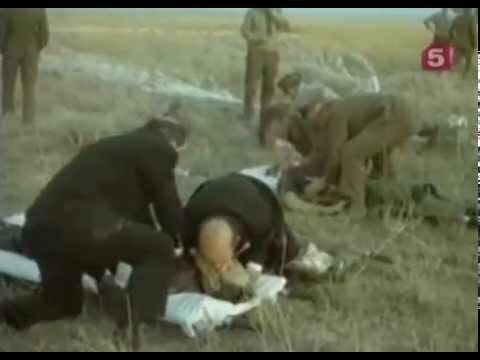 Komarov died in the only fatal parachute mishaps of the history of spaceflight. Apollo 15 experienced a parachute failure while returning from a Moon mission, but the redundant design of the Apollo capsule allowed the crew to splashdown safely with only two out of three parachutes. 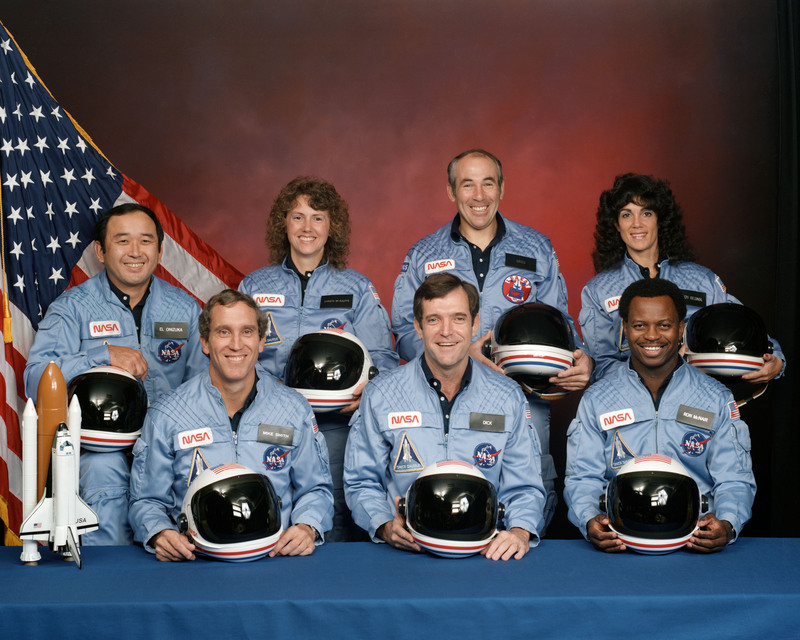 The Challenger crew is the only one that died in a launch accident. During the course of the Russian space program, two manned launches ended catastrophically: the Soyuz T-10-1, which exploded on the pad, and the Soyuz 18-1, which exploded at an altitude of 149km for a separation failure. In both cases, however, the crew was brought to safety provisions of the Soyuz capsule. The Columbia crew died during reentry, one of the most critical phases of spaceflight. The Russian space program experienced reentry anomalies in several flights, most notably Gagarin’s Vostok 1 and Soyuz 5, both of which failed to properly separate the service module. In both cases, however, the heat of reentry eventually severed the connections, and gravity helped re-orienting the capsule, which proceeded into ballistic reentry. On January 27, 1961, NASA conducted a routine ground test of the Apollo-1 command module. The three astronauts, Gus Grissom, Ed White and Roger Chaffee, were preparing for the first flight of the Apollo program, which would test the Apollo Command and Service Module. As the astronauts inside the capsule were conducting the test, a fire broke out in the command module, igniting the high-pressure pure oxygen atmosphere. Astronaut tried to escape, following the inadequate safety procedures, but the inward opening sealed them inside the capsule, killing all three. It was NASA’s first human losses in the space program. The investigation board found that the pure oxygen atmosphere of the command module combined with the presence of combustible material had posed a very high risk that NASA had failed to account for. An electrical spark had ignited a fire and the high-pressure atmosphere had prevented the astronauts from opening the hatch quickly. Moreover, safety considerations had been based on a space environment and not for a ground test. NASA had chosen a pure oxygen atmosphere for the command module for a variety of design and efficiency reasons. But after the accident, modifications were made to the module’s atmospheric composition, materials, hatch, and the space suits. 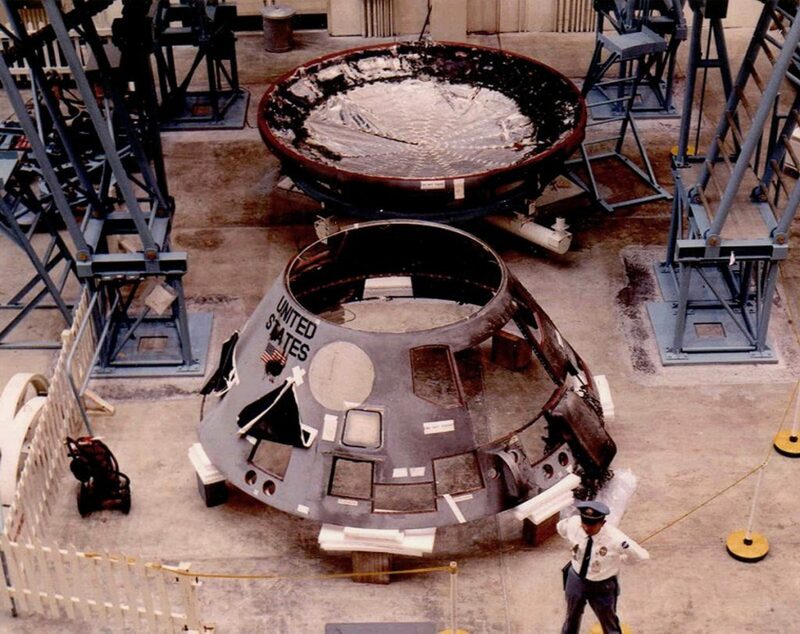 The Apollo 1 spacecraft nearing the end of the disassembly. Sometime towards the end of March, 1967. Credit: NASA. At the height of the space race, a few months after the Apollo-1, the Soviets were determined to gain back the lead. They wanted to capitalize on the United States’ presumed weakening due to the Apollo-1 fire. Their new Soyuz spacecraft was an advanced 3-person capsule, fully maneuverable, capable to automatically dock in space, and it was designed to withstand a reentry from Moon trajectory. Unfortunately, the spacecraft was not ready for human flight. Not a single one of the three earlier unmanned tests succeeded, and both engineers and cosmonauts knew about the many unresolved problems. But once again, the pressure from the Soviet government to beat the Americans led to compromises on testing and safety. A presumably historic flight, the Soyuz-1 launched on 23 April 1967 with cosmonaut Vladimir Komarv on board. The Soyuz capsule was plagued by an array of problems right after launch: failure to deploy a solar array, problems with the attitude control, even communication issue. The mission was aborted, and Komarov underwent a dangerous manual reentry knowing his chances to make it to Earth were slim. He miraculously survived reentry, but the parachute failed to deploy. With only the drogue chute deployed, the spacecraft slammed into the ground at tremendous velocity, instantly killing the cosmonaut on board. The accident resulted in modifications to the Soyuz, which have since made it the most reliable spacecraft. But it also led to the Soviets losing the race to the moon. – Read our section on Soyuz 1. After America’s successful moon landings, the Russians were keen to portray their space program as achieving success in a new area. On April 19, 1971, they launched Salyut-1, the world’s first space station. On June 07, 1971, Soyuz-11 carried Georgi Dobrovolski, Vladislav Volkov, and Viktor Patsayev, to the station. The mission, consisting of scientific experiments and observations, was carried out triumphantly for over three weeks, a new record. The three cosmonauts had turned into celebrities and heroes back home. On June 29, Soyuz 11 left the Salyut-1 for its return trip. A perfect landing followed a nominal reentry procedure, but the cosmonauts were not responding to mission control. The ground team, hoping for a communication panel failure, opened the hatch. Inside the capsule, the three cosmonauts were still and unresponsive. Doctors made a fruitless attempt at reviving them, but the cosmonauts had been dead for 30 minutes. As the nation reeled under the shock, investigations found that the Soyuz descent module had undergone depressurization when the instrument and orbital modules had separated. A faulty equalization valve had opened up while the craft was still at high altitude. The cosmonauts, who were not wearing spacesuits, could not react in time and suffocated to death. The decision to board cosmonauts unsuited dated back to the first three-man flight on the Voskhod 1 capsule. At the time, spacesuits were not an option in the cramped space of the early spacecraft. With the Soyuz, spacesuit were simply considered redundant, unless the mission included planning for EVAs. The lessons learned from the sacrifice of the Soyuz-11 crew benefitted every cosmonaut and astronaut who flown on the Soyuz since then. The accident led the Soviet to redesigned the Soyuz capsule to carry only two cosmonauts wearing light pressurized spacesuit during launch, docking, undocking, re-entry, and landing. The Soyuz would reacquire a three-man capability only in 1980 with the upgraded Soyuz-T.
– Read our section on Soyuz 11. A video of rescuers offering initial support to the bearded Georgi Dobrovolski. Little did they know at the time that all three men had been dead for far too long for resuscitation to have any positive effect. On January 28, 1986, seven astronauts lost their lives when Challenger broke up 73 seconds after lift-off. The investigation that followed found out that the accident had been caused by a defective design of the field joint of the solid rocket booster that had allowed hot gasses to pierce-through an O-ring seal and destroy the external tank mid-flight. However, the most disturbing realization came out when it was discovered that NASA management had known about this issue, and that nonfatal O-ring erosions had been observed in previous flights. The day before the flight, NASA management had overruled an attempt of Morton Thiokol, developer of the solid rocket boosters, to postpone the flight. Budget and public relation considerations had more than played their part in forcing NASA to launch with less-than-optimum readiness. After the accident, recommendations were provided to change the design of the booster field joint, and new procedures and processes were put in place to prevent the communication bottlenecks that caused the disaster. 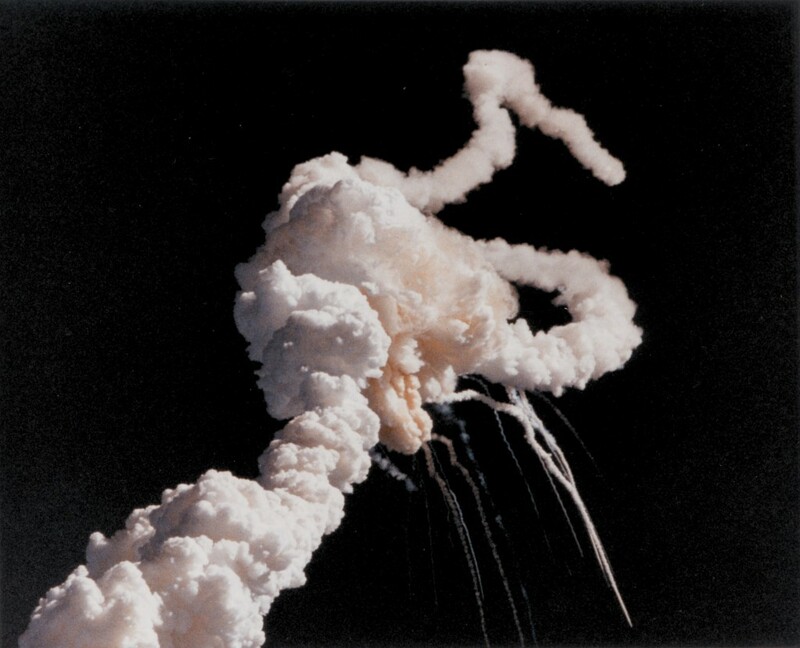 – Read our section on the Space Shuttle Challenger Disaster. On 16 January 2003, at a time when the Shuttle program had been active for more than two decades, Columbia burned up on re-entry killing all seven astronauts on board. The technical cause was tracked down to a faulty design of the external tank, which tended to shed foam blocks during ascent. Two days after the launch, during a routine review of the launch footage, a particularly violent foam strike was noticed. Like with Challenger and the O-rings, foam shedding and foam strikes had been observed during numerous flights, but NASA management had become complacent about it, falling into the trap of thinking that nothing will happen because nothing had happened in the past. In the case of Columbia, however, the foam strike caused a hole in the left wing’s reinforced carbon-carbon panel. The hole allowed hot air to enter during reentry, weakening the structural integrity of the vehicle and causing its ultimate demise. The organizational factors behind the accident were shockingly similar to Challenger. Safety regulations had deteriorated, internal communication was ineffective, and administration had become inadequate. An independent investigation commission concluded that NASA could no longer run the Shuttle program safely and asked for it to be shut down. Until the end of the Shuttle program in 2011, there were no more accidents. But to date, NASA has not gained back its capability to autonomously launch astronaut to space. – Read our section on The Space Shuttle Columbia Disaster. The Nedelin catastrophe was a disastrous launch pad accident that happened on 24 October 1960. More than 150 people died in this accident, and many more were badly wounded. While this accident happened outside of the human space program, its causes, consequences, and lessons learned have a universal application, even outside the space sector. The accident got its name from Marshal Mitrofan Nedelin, its main responsible. Nedelin was commander of the USSR’s Strategic Rocket Forces, and as such he was in charge of the R-16 intercontinental ballistic missile development. The missile was highly important for the Soviet Union, and Nedelin wanted to speed up its development to gain political prestige. The R-16 missile was fueled with highly toxic and corrosive hypergolic UDMH as the fuel and a saturated solution of dinitrogen tetroxide in nitric acid as the oxidizer. This choice of fuel was ideal for an ICBM that needed to remain stored in silos ready to be launched within minutes – the US were using similar fuel for their Titan missile program. Risks connected to the fuel were known and accounted for in the safety requirements of the launch procedures, but Nedelin’s insistence in speeding up the test created extreme pressure on the launch schedule, with the consequence that safety procedures were overlooked or ignored entirely. On the launch day, there were several problems that the engineers patched up. A short-circuit ignited the second stage prematurely, which detonated the fuel tank of the fist stage. The resulting explosion killed more than 150 engineers, technicians, and military personnel involved in the test, including Marshal Nedelin himself. The accident was covered up, and became known in the west only on April 16, 1989. This devastating accident showed how dangerous is to let political pressures supersede safety concerns, a recurring theme in the disasters that followed. – Read our section on the Nedelin Catastrophe. 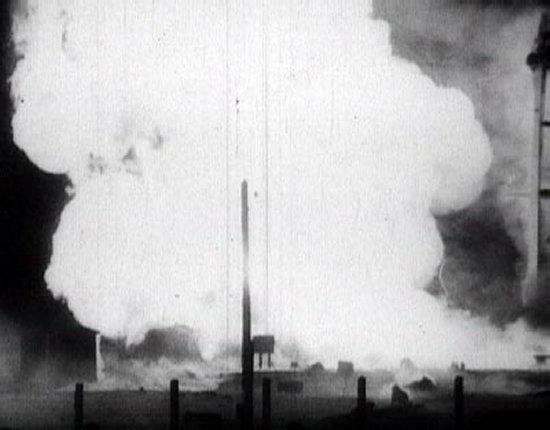 The explosion of the R-16’s first stage fuel supply fed a ferocious fire (Credits: USSR). There are some common traits to all spaceflight accidents: a defective design, complacency about existing safety measures, and a management failure. 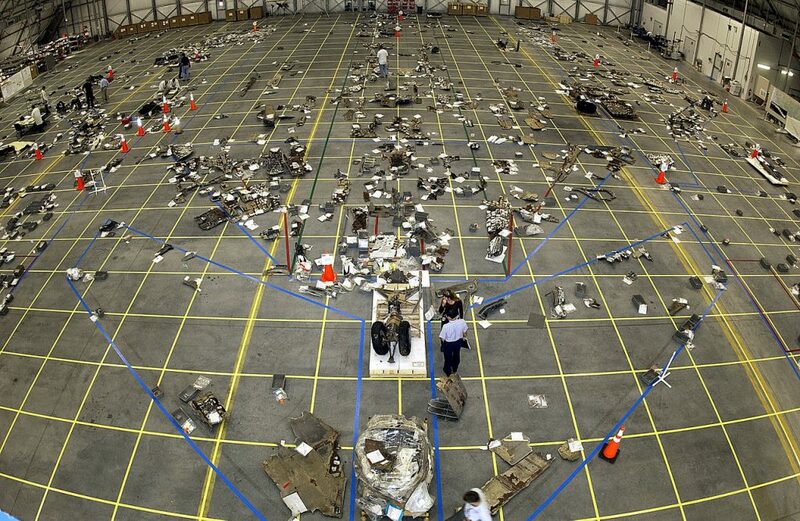 A defective design is the root cause of most space accidents. The nature of the defect is so striking that it seems obvious in hindsight. The use of a 17 PSI pure oxygen atmosphere during a ground test in case of Apollo 1, the imperfect sealing properties of Shuttle Challenger’s solid rocket booster’s O-rings are both examples of this. But a defective design can be identified and corrected before it leads to an accident thanks to quality assurance and analysis of flight parameters during testing and operation of any space hardware. This is where complacency comes into play. Disastrous accidents involving complex systems are always preceded by so-called accident precursors, which take the form of parameters out of tolerance. People responsible for those systems become accustomed to the idea that nothing bad will ever happen because nothing bad has happened yet. A routine inspection of Columbia’s ill-fated launch’s footage performed just a few hours after the launch revealed a foam strike. Mission Control dismissed the strike because the phenomenon had been seen before. The Columbia Accident Investigation Board indeed revealed that every single Shuttle launch presented a certain measure of foam shedding from the External Tank; and even though a precise requirement was set about the tolerance for such foam shedding, the tolerance was simply increased to accommodate the measurements. It takes a serious management failure to allow a complex organization to become accustomed to the warning signals of a defective design. This failure is often the consequence of pressures to keep up with unrealistic schedules or budgets. When the space Shuttle was first introduced, NASA management claimed it had a reliability of 1 accident in 100,000 flights. After the Challenger Accident, it turned out that the engineering community believed that the reliability was a much more realistic 1 in 100 flights. The engineering community knew about potential issues with the O-rings, but their warnings had not been communicated to the management, and even when they did, they were systematically ignored. Every single space disaster, presents a similar set of conditions. In an ideal world, safety would have prevented space accidents. Since it did not, we have the moral obligation to investigate the causes and learn how to prevent them. People involved in the design and operation of space vehicles should study in depth accident reports, watch the videos of Shuttle Challenger explosion, listen to the recording of the Apollo 1 crew during the fire that claimed their lives. As Soviet rocket designer Boris Chertok muses in recounting the Nedelin catastrophe, “To one degree or another, the lessons of the past have remained relevant for almost half a century.” If we revisit them, these lessons may continue to save the day well into the future. There is much to be said about space accidents that have happened as well as those that remain so far unfulfilled because it is time to move beyond the fatalistic idea that they are just unfortunate occurrences in an inherently dangerous endeavor, such as spaceflight is. Advancement in safety can be brought forward along with advancement in performances, as in civil aviation and car racing. The analysis of how one might die in space, on a planet, or on the launch pad may bring more awareness about how to avoid such a fate. And while the risk connected to spaceflight cannot be brought down to zero, we can and should do everything possible to understand and mitigate such risk, in order to prevent the next tragic space disaster.